While I like watching Netflix shows, I love to binge watch TED Talks. TED Talks are just my style with thought-provoking content delivered in 18-minutes or less. 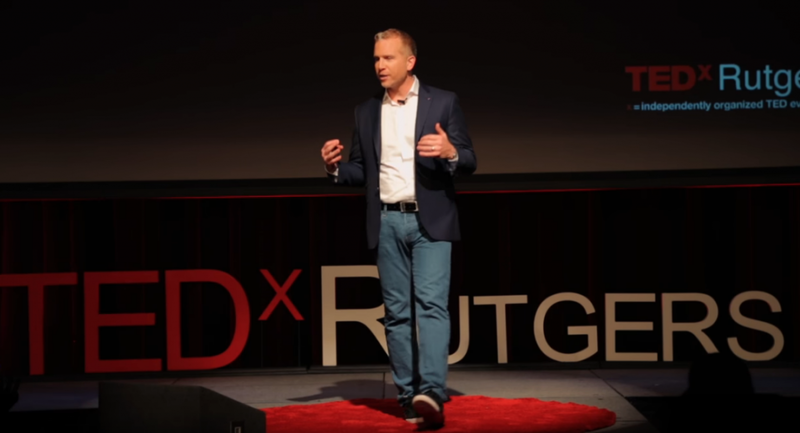 So, when I was asked to give a TEDx talk of my own at Rutgers University, I jumped at the opportunity! Over my career, I have given hundreds of talks on the power of sport psychology and mental training. In fact, I believe giving an informative, entertaining and motivating talk is one of my strengths. For me, my own TEDx talk was something new, exhilarating, and challenging given TED’s ability to spread new ideas. As a sport and performance psychologist, I wanted to share what I have learned over my career working with the elite athletes in the NFL and MLB. I have learned a valuable life philosophy from these experiences… that life can be viewed as a sport. No matter whether it’s business or relationships, we bring different versions of ourselves and our ability to access our true talents to each of life’s important minutes. It’s my passion to teach everyone how to use the same techniques athletes do to perform the best on their personal playing fields in work and love. As soon as a I got the TED call I began to work on my talk. Some people find it embarrassing to practice public speaking in front of people they know. Personally, I find the honest feedback helpful. It makes my work better. One of the pieces of feedback I got lead me to a way to improve my message and adhere to it in my own life! A few years back, I read the article My Personal Best in the New Yorker by the acclaimed surgeon, Dr. Atul Gawande. In this article, Dr. Gawande recounts his efforts to secure a coach for his surgical operations. Although he was an expert, he was still looking for ways to improve. I was so motivated by this article that I began to think of how I could take my own advice and get better at the craft of public speaking. I asked a trusted member of my team about what coach she thought would be best for me as far as a coach. We settled on the idea of hiring an improv comedy coach. As a drama graduate of NYC’s LaGuardia High School of Music, Art and Performing Arts (The “Fame” School), I was intrigued by the idea of a performance coach with a comedy and acting background. I learned a lot from the feedback my coach gave me. Here are the top three presentation tips he gave me. Top three tips that helped me improve my TED game. I’m naturally a high-energy person who likes to move around. With my coach I realize that practicing moving intentionally and with purpose added to the power of my presentation. I practiced delivering a complete thought before I walked to a different part of the stage. Athletes and performers watch themselves on tape. We often resist the work of truly looking at ourselves perform, give talks and speak in meetings. Watching my practice with my coach allowed me to observe and adjust subtle body language. In addition, I was able to refine my message by responding to what I heard myself say. Less can be way more. My coach helped me edit and focus my story examples to improve the impact. This also helped up the humor factor. On the day I delivered my talk on TED’s signature ‘red dot’ carpet, I felt my best. I was ready! I had prepared and practiced for my talk: writing content, perfecting structure, improving delivery, and enhancing jokes. On stage, I experienced my own mantra to “live life like a sport.” I was having fun and making the most of my own 18 minutes. To my delight, the audience joined me in the playing field by listening, laughing and participating. Here’s a link to my TEDx talk, “How Sport Psychology Can Help You Win At Life.” In it you’ll learn about how to use my mental conditioning techniques to be and feel your best. I hope you enjoy watching it as much I as enjoyed the process of creating it! « Are You a Mom or Dad Who Has Had Thoughts About Hurting Your Baby?